Sometimes skipping the simplest steps are responsible for the biggest problems. Failing to filter finishes immediately prior to loading into your spray system is one of the leading causes of contaminated and less than perfect spray finish results. Unstirred particles or a tiny bit of debris dropped into the finish when opening the can lid can quickly ruin all your preparations. Yes, that little "dried bit" or wood chip fallen off of your sleeve will easily stir in and go through the spraygun... and land right in the middle of your tabletop or door panel! SPLAT!! Don't put yourself through the extra work and frustration...use a quality strainer! Spectographic lot tested: guaranteed free of chemical and particulate contamination. Patented filter tip for quicker, more complete filtering. 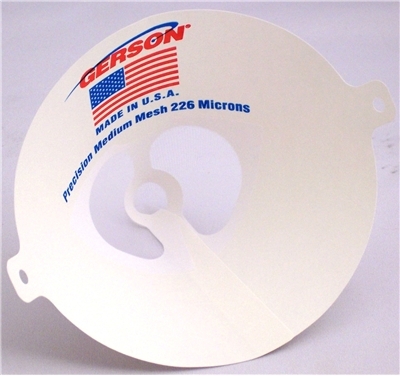 260 micron (Medium Mesh) is sufficient filtering for most waterbased products. 190 micron (Fine Mesh) is suited for filtering lower viscosity products such as shellac and dye solutions. Each mesh is available as a 10 pack or in a Box of 100. We have also re-packed them as a "Combo" pack of 25 each 190 and 260 micron filters for your convenience and cost saving.